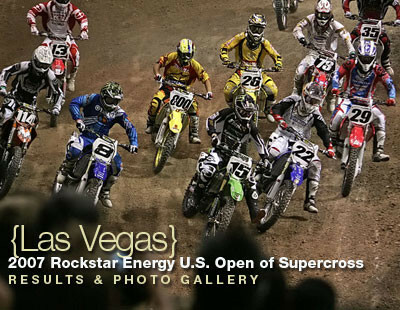 Click the following link for a 34-photo gallery of Supercross race action from the 2007 Rockstar Energy U.S. Open of Supercross. You can also click the following link for an 18-photo gallery from Saturday's pre-race action in the pits, as well as timed qualifying. Need links to Friday's action? Click the following link for a 37-photo gallery of Supercross race action from the Rockstar Energy U.S. Open. You can also click the following link for a 37-photo gallery from Saturday's pre-race action in the pits, as well as timed qualifying. Don't forget, if you're a Vital MX member, you can comment on any of the photos in the gallery. Not a member? Join now! It's fast and free. The first night of the Rockstar Energy U.S. Open of Supercross was a bit predictable, with Chad Reed taking an easy win. But on Saturday night, with the big $100,000 overall check on the line, along with a shot at a much larger payday ($250,000) available for Reed if he could repeat his previous night's performance....well, things got a little crazy. Things started off right for him in the Superpole qualifying, when he laid down the fastest lap. Now he just needed a main event holeshot, and a win in the main to score big. Unfortunately for him, it didn't work that way. Once again, Timmy Ferry had an advantage heading into the first turn. But where Chad had been able to nudge his way by Ferry at the start of Friday night's main event, this time around he came in too hot, knocked Ferry (and himself) down, and took a chunk of the pack with him. As everyone scrambled to remount and rejoin the race, Jake Weimer took advantage of the situation to go on and win the main event aboard his 250F Honda, with Josh Demuth in tow. With Friday night's top finishers at the back of the pack and looking to move up, there was quite a bit of confusion as to who was holding the advantage for the overall. It wasn't as easy as adding moto scores, because they were using the AMA's points-per-moto system. Reed was working his way forward, but a crash with Andrew Short, followed by a remount and tangle with Langston, left him in eighth at the checkers. Langston had gone from near last to fifth at the end. As everyone waited for the word from scoring, some were anxious (Langston), some were bloodied (Reed), and some were mad (Ferry), but the overall went to Langston. He and Reed had tied him on points, but Langston got the nod based on his better finish on the second night. For much more from the night, check out the link to the photo gallery from the race above.